Neil Gaiman's Journal: A small fit of madness, or a good idea. Not sure. A small fit of madness, or a good idea. Not sure. Black Phoenix Alchemy Lab just sent me an extra couple of sets of their Graveyard Book scents. (Eau de Ghoul seems extremely popular on their forum.) (And the very final handful of signed Snow Glass Apples booklets and vials can still be had before the Holidays -- for now -- at the CBLDF shop site.) I have a large pile of lovely two-sided Graveyard Book posters (one side Dave McKean's cover, one side Chris Riddell's cover) that Bloomsbury did. 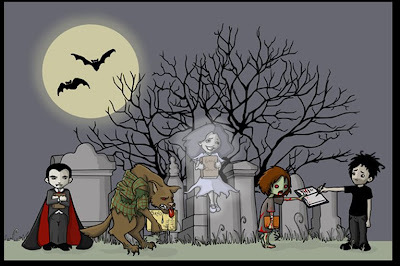 From here until the end of the year (and further out than that, if the stuff holds out), if you do something effective to help get other people reading The Graveyard Book, tell Cat, and she'll send you a signed poster. If you do something Awesome and Amazing to get other people reading The Graveyard Book (for example, talking your whole town or city into having one of those months where everyone in the town reads the same book, and it's The Book In Question...) then you get a signed Graveyard Book poster and you get one of the BPAL Graveyard Book scent collections. 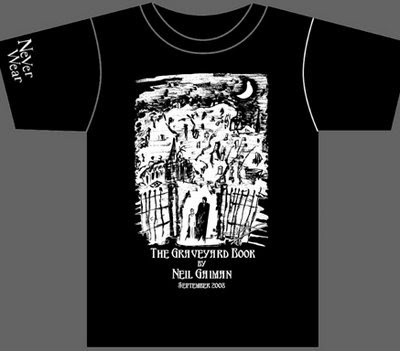 And she'll probably throw in one of the Graveyard Book Neverwear tee shirts as well. Possibly even give you a Kendra Stout Graveyard Mousepad. Send email, photos, cuttings from your local paper, proof that it was you and you alone who talked Oprah or Richard-and-Judy into doing The Graveyard Book on their TV book clubs, etc., to Cat Mihos, Furrytiger@Gmail.com . Do not send them to me. I will not have the swag. I will not be handing it out. I'm merely going to set this thing in motion and sign fifty posters -- twenty five on the McKean side, the other twenty five on the Riddell side. Cat's decision is final. She'll blog the things she gets in as she goes along at the Neverwear Blog (http://kittysneverwear.blogspot.com/). And then every now and then I'll do a round up here.